With the handsome catch in Shelter Island, Alaska are Les, Louise, Eric, Rydge and Captain Kenji. As a kid growing up in Hawaii, I loved to go fishing. Couldn’t afford to own a fancy rod and reel, but managed with a hook, line and sinker attached to a bamboo pole. A pocket knife was a prized possession that most of us carried around in our pockets each day. For bait, shrimp caught in a river or a ditch close to home, or periwinkles along the beach. A pail to put our bait and catch in, and if I forgot the pail, a green twig to gill my catch would suffice. Hadashi or a pair of slippers to walk along the lava rocks or the sandy beaches. Yes, this was heaven for me. And recently, I got to witness the expressions of Rydge Kohagura and Alex Hanz, two excited youngsters on a trip to Shelter Lodge out of Shelter Island, Alaska. I thought how fortunate they are for their parents to bring them all the way from Hawaii and Southern California to fish in Alaska. I realize that times are different now, but just the idea of parents planning far in advance to bring youngsters to Alaska to fish is sort of overwhelming. Rigged bamboo poles — no way! Leave the o-amas, menpachis, ajis, and the hinaleas alone ,but the likes of sablefish (black cod), halibut, salmon and hefty rockfishes are caught most each day. Rydge and Alex experienced fishing for black cods with electric reels 500 to 600 meters deep, halibuts down 300 to 400 feet deep, and salmon on flat-line lures and down-riggers. Experienced skippers Kenji, Brandon, Ben, John and Kim constantly positioning the boats over the hot spots and rigging the rods and lines to accommodate the different species to be caught. Pocket knife was not necessary for the skippers constantly baited and rebaited our hooks. 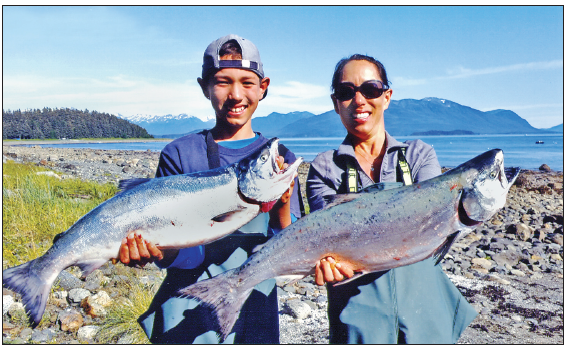 Alex Hanz and his mom, Hash, show off their individual hauls. Nearing noon, you eat your bento, Spam musubi, or wrap, prepared by chefs Kenny and Jake. Chips, snacks, and cookies always in the tote box. I found time to relax in the cabin of the boat and even took short snoozes. Wow! This sure beats fishing with a bamboo pole and a tiny hook. As each day on the waters went by, I knew that these youngsters were becoming more experienced and knowledgeable about the various types of fishes and how each species is caught differently. That will be etched in their minds for a long time to come, and stories that they will tell their friends, thanks to their parents, Eric Kohagura and Hash Hanz. The sad part to this story is that it had to be released because it was a wee-bit undersized, but Rydge is a true fisherman at heart. He said, “This is great and better than Southern California,” and looking back at his mom in the same breath saying that he would like to come back to Shelter Lodge again next summer. The smile and expression on his face painted a thousand pictures. 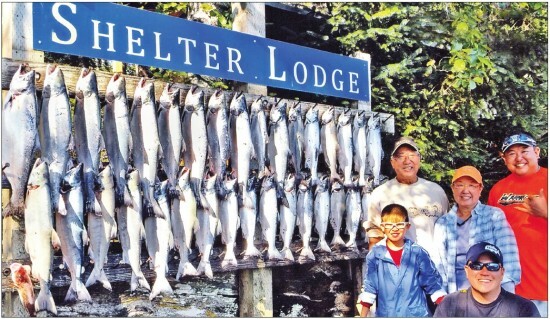 For a trip north to Alaska and to fish out of Shelter Lodge … Oooh! How I wish I were a kid again … I can put my bamboo pole away.